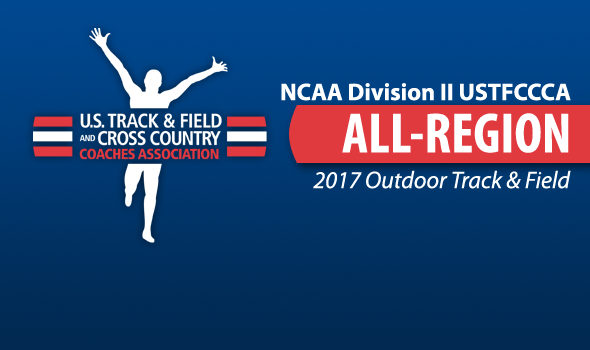 NEW ORLEANS — The U.S. Track & Field and Cross Country Coaches Association (USTFCCCA) has announced the All-Region honorees for the 2016-17 NCAA Division II Outdoor Track & Field season. A total of 671 men from 144 different institutions made up the 913 men’s All-Region honors. Southern Connecticut led the way with 27 All-Region honorees, while Lincoln (Mo.) and Angelo State tied for the 2nd-most with 23. Texas A&M-Commerce posted 22, and Ashland and Chico State each had 20. Two men’s athletes in Academy of Art’s Mobolade Ajomale and Ashland’s Myles Pringle earned 5 All-Region honors each. Ajomale starred in the 100, 200 and 400 meter races, in addition to taking part in the 4×100 and 4×400 relay teams. Pringle’s honors came in the 200 and 400 meter races, the 4×100 and 4×400 relays and the high jump. On the women’s side, 621 women from 147 institutions made up the 925 women’s All-Region honors. Seven programs boasted 20 or more women’s All-Region honorees, led by Grand Valley State’s 25. Pittsburg State and Nova Southeastern each posted 24, followed by Southern Connecticut (23), Adams State (22), Southern Wesleyan (S.C.) and Wingate (20). Nova Southeastern’s Shakira Bartley, Pittsburg State’s Emilyn Dearman and Saint Augustine’s Tia-Adana Belle each earned a whopping 6 All-Region honors. Bartley picked up the honors for her work in the 100 and 400 hurdles, the 4×100 and 4×400 relays and the long jump and triple jump. Dearman was an All-Region performer in the 100 and 400 hurdles, the 4×400 relay, the high jump, long jump and heptathlon. Belle picked up her 6 honors in the 200 and 400 meter sprints, the 100 and 400 hurdles and the 4×100 and 4×400 relays. Additionally, GVSU’s Angela Ritter and Southern Connecticut’s Shatajah Wattely each notched 5 All-Region honors. Ritter and Wattely earned their honors in the 100, 200 and 400 meter races, as well as the 4×100 and 4×400 relays.